Classroom Free: Excuses, always excuses. I got my wrist well and truly slapped at home-ed group today, and I got accused in no uncertain terms of being a "badddddd blogger!" How very dare she! I won't name and shame the person concerned as I don't want to take responsibility for the repercussions, but hmmm, you know who you are missus! Look, I'm here, I'm blogging. Happy now?! *grin*. I do have quite a valid excuse reason though. My laptop battery is dying. Actually, I've had 3 laptop batteries die on me since mid-December. Cheap rubbish. I bought one, plugged it in and it worked brilliantly, so bought another two (one for Chelsea's laptop and one for a spare). All three are total rubbish. I'm awaiting a "better quality" one and waiting for a suitable outcome (i.e, refund) for the others. This issue has of course dictated that computer time is severely limited (not a bad thing in this household actually), and I haven't been online a great deal. In turn, this has led to lots of paintings being done which means a very happy creative mama in the evenings (or early morning) when bubba goes to sleep - usually after 1am *yawn*. 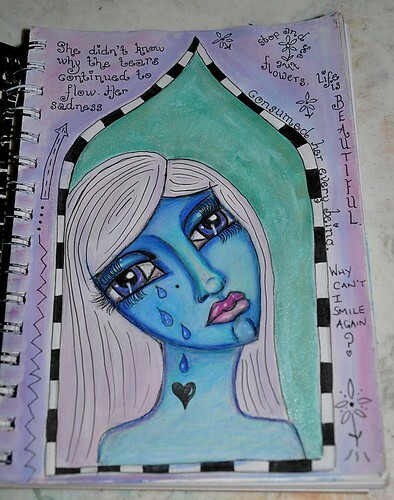 A page in my art journal - the day I painted this I felt sad. This will be framed and hung on MY wall in MY house. I'm still very much on the learning curve and very much enjoying the journey. Hopefully these photos have tempted you to follow my other blog, I'd love your support as it's something very new to me (and very scary if the truth be told). I'd love to be able to share with you wonderful things that we have been doing home-ed wise, but I'm afraid I can't as nothing much has been going on. We are just about finding a routine again - with the restarting of our home-ed groups on Mondays and Wednesdays. On Monday we went for a beautiful riverside walk, trying to follow a map, and looking for animal prints in the mud and wet earth. Today we went to the Soup Kitchen Exeter group which is held in a park and the kids enjoyed a social afternoon with friends. Delicious home-made soup was created which was scrumptiously shared out with garlic bread. Oh life tasted so good! The weather was near on perfect, lovely winter sunshine peering down from a blue sky. Stupidly I didn't take my camera as I would have gotten some cute pictures of Taisia exploring the park using two feet for the first time, her knees stayed clean! I love how free she feels to explore, safe and secure in the knowledge that her mama is never far away. Her smiles are precious and the joy she finds in the simplest of things infectious. Just sitting in a pile of scrunchy crunchy leaves brings such delight, catching a glimpse of a butterfly or watching a ladybird crawl by earns complete concentration and undivided attention. We could learn so much from our little ones. Other than that the children have still been in "recovering from the novelty that t'was Christmas" mode. They have spent time getting used to having an XBox, and we have recently bought Guitar Hero (well it was on offer!) which has become a firm favourite of mine for all. I'm not sure if the teens are embarrassed or in awe of their ol' mama strumming away (and occasionally beating them - I just had to get that bit in!) Our new board games have been overplayed - Cash free Monopoly has been a big hit (although they all want to use the card machine and it can get a little bit, erm, heated, at times). Game of Life has produced many giggly moments and interesting discussions, and Guess Who has created smiles in abundance. All good. We will get back into project work at some point no doubt, I just can't guarantee when that will be. So, back on track with the blogging and with life getting back to normal after illness and down in the dumps moodiness stopped play. Tomorrow we are chemistry set using, art journal cover decorating, and .....?? It felt good to write the blog again actually, kinda therapeutic. 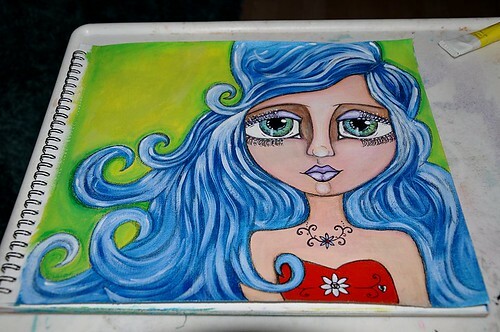 I wish you would do an art journal again, I'd love to see what you came up with. Guitar hero is good isn't it lol good to hear you're having abundant giggles. Thanks hunny, I'm loving the arty process. My 9 year old daughter spotted your drawings over my shoulder. She says the first one reminds her of Juliet from Romeo and Juliet. They are lovely. They are beautiful, you are quite good. Glad to see you back, I enjoy reading your blogging!